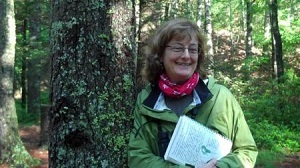 Headwaters own Betty Gatewood: educator, artist, Master Naturalist! Three Headwaters members set out on Sunday morning, January 19th to the Walker Nature Center in Reston, Virginia, to hear one of our own present on the History of the American Chestnut as a teaching story for children. RoxAnna and Betty Forrest are from the same Headwaters 2011 Basic Training class as Betty Gatewood – the program presenter. Stephanie joined the Headwaters Chapter from the New River Chapter in Blacksburg and provided safe navigation to our Reston destination. On the way, Betty Forrest expressed her excitement over hearing that Betty Gatewood was going to talk about the American Chestnut. She shared with Stephanie and RoxAnna how very important to Betty G. and her husband Mark the restoration of the American Chestnut trees is. Of Betty Gatewood she says: “Betty G. always greets you with a smile and you know she is going to impart knowledge in a very exciting manner, with her excellent illustrations of plants on her book marks. Both Betty and Mark are avid hikers and are perfectly suited to be the ones to talk on this cause”. We reached the Walker Nature Center in plenty of time to meet some of the other participants. The small conference room was filled with an assortment of attendees to the tune of over twenty people. The Virginia Master Naturalist Program was well represented. In addition to our Headwaters Chapter, the VMN Pocahontas Chapter based in Chesterfield County and the Richmond Metro Area and the VMN Banshee Reeks Chapter based in Loudoun County joined members of The American Chestnut Foundation (who organized and sponsored the event), the Virginia Master Gardeners Program, the Frontier Culture Museum, Fox Haven Nature Center and Johns Hopkins Environmental Studies Program to be guided by Betty’s experiences and hopes for the future of children and young people learning from and in the natural world. The American Chestnut, Castanea dentata, was one of the most important eastern forest trees before being practically eliminated in the early 1900s by an airborne bark fungus causing chestnut blight. The program began with introductions by all attendees. Betty G. then presented a number of excellent resources that educators can use in teaching the history, preservation and reintroduction of the American chestnut. The resources we were shown place emphasis on hands-on learning and are curricula that focus on getting children outdoors. Betty noted how a variety of learning goals can be met with such outdoor education. Through work with American chestnuts, children will learn and improve skills of observation, problem solving, use of technology and stewardship of resources. Outdoor education is also beneficial to children’s physical and mental health. The American Chestnut Foundation is a great source of chestnut related information and learning activities. We were shown their Charlie Chestnut curriculum for elementary and junior high age students. Presentation attendees enjoyed exploring the Chestnut Learning Boxes on our tables. The boxes are available from The American Chestnut Society. These big plastic tubs contain binders with curricula detailing activities using the box’s many specimens including leaf samples, burr specimens and tree ring slices. The learning boxes are designed for junior high and high school students. The American Chestnut Foundation –VA Chapter is very active, hosting citizen science opportunities and providing learning resources. Presentation attendees were introduced to the Appalachian Trail Mega-Transect Chestnut Data Project, an effort using volunteers to identify, map and collect data on the American chestnut trees along the Appalachian Trail. Details are found on the VA Chapter website. We also learned of the Trail to Every Classroom Project of the Appalachian Trail Conservancy and the National Park Service. This program provides resources enabling teachers of kindergarten to high school-aged students to use the Appalachian Trail as a site for service learning. The Virginia Governor’s School is another institution that is building science, technology and problem solving skills in young people through innovative hands on education. We learned of a cutting edge scientific project carried out by students concerning the preservation and reintroduction of the American chestnut. The Valley/Ridge Regional Summer Governor’s School serves our area and has a component at James Madison University. And just as Betty Forrest promised, a final highlight of the presentation was the lovely bookmarks given to us by Betty Gatewood and featuring her beautiful watercolor artwork of chestnut burrs and leaves. Thank you, Betty! After the presentation, some participants went for a brief hike outside the Walker Nature Center. We visited a young American chestnut tree on the property. It was good to see a living example of what we discussed in the presentation. We enjoyed searching for and examining leaves dropped by the chestnut. Unfortunately, the tree we saw had the chestnut blight. It is being monitored frequently by one of the many talented volunteers we met at the program. Betty’s program provided Virginia Master Naturalists with a variety of excellent resources we can share and use in education. There was a focus on young people as future stewards of the American chestnut. We met many dedicated people who are realizing this goal by actively teaching future generations how to appreciate and preserve nature. February 5, 2014 in Training.